The premier shoe horn manufacturer and distributor in the USA. 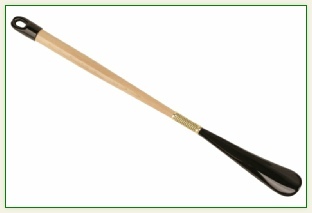 What is a shoe horn: A shoe horn is a tool that lets the user put on a shoe more easily. It does so by keeping the shoe open and by providing a smooth surface for the foot and the heel to move, without crushing the shoe’s counter (the vertical portion of the shoe that wraps around the back of the foot). A shoe horn is a useful tool at any age. From young kids putting on their shoes before school to an older individual having trouble with mobility, but they are especially helpful for those who have recently had hip or knee replacement surgery or those who suffer from chronic upper or lower back pain. Wheelchair users will also benefit from these devices. Shoe horn specifications: Our shoe horn sizes range from 19” all the way up to 31” in total length. The wood spindle determines the length of the shoe horn. Each shoe horn consists of ¾” solid wood spindle with a clear finish. The different types of hard wood we use are oak, maple, cherry, walnut, and mahogany. The brass spring is strategically placed on the shoe horn. It allows you the flexibility to put your foot into virtually any shoe from almost any angle. The custom brass pieces, which are attached on both ends of the spring, are specifically manufactured for this shoe horn. These pieces, along with two dowel screws, are an intricate part that hold the shoe horn together. The shoe horn is designed to contour around the back of your shoe (the counter) while you slip your foot into your shoe. These shoe horns are made of a high quality plastic. This part can be produced in virtually any color. We top these shoe horns off with a hanger cap for convenient storage. 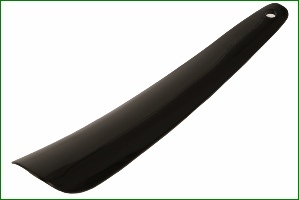 We also manufacturer a 7 1/4” shoe horn which is made of durable lightweight plastic. It is specifically engineered with a contour design for ease of use. It even comes with a built in hanger hole for convenient storage. Its compact size makes it a perfect travel companion. All of our shoe horns are MADE IN THE USA, with the highest quality materials. While adding distinction and convenience to anyone's dressing process, our long shoe horns also offer the proven health benefits of reducing bending, straining and unnecessary joint stress of the young and old. A corporate logo can be placed on either side of the shoe horn and given out as corporate gifts. Learn more. Please click on the images above to view all of our shoe horns in the photo gallery page. Our shoe horns are made exclusively in the USA, with the highest quality material.